Alsasafe is extremely durable, two-layer system with different thicknesses, providing an optimal protection against falling. Alsasafe is particularly flexible system in which the layer system depends on the requred safety factor and can be adjusted to critical fall height. 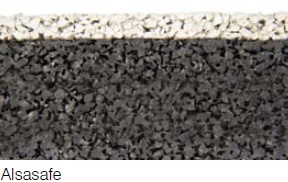 Soft, flexible and water permeable surface with high durability. 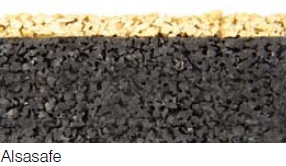 The base layer consists of black SBR rubber granules mixed with polyurethane binder, while the outer layer is a mixture of coloured EPDM and polyurethane. It is a flexible system which thickness depends on the required safety factor. For example a critical fall height with thickness 50 mm is 1.6 m.